Trending at $147.50Trending price is based on prices over last 90 days. Trending at $137.90Trending price is based on prices over last 90 days. Trending at $120.75Trending price is based on prices over last 90 days. 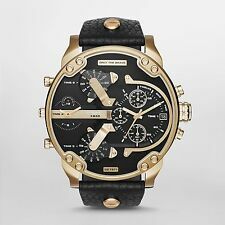 NEW DIESEL DZ7320 Watch Daddy Chrono OverSized unisex Leather Strap MEN Women! 4 product ratings - Diesel DZ4345 Men's Stronghold Chronograph Oversized Denim Strap Watch NEW! Diesel Men's Mega Chief Gunmetal Stainless Steel Bracelet Watch DZ4421 NEW! 1 product rating - Diesel Men's Mega Chief Gunmetal Stainless Steel Bracelet Watch DZ4421 NEW! This page was last updated: 23-Apr 03:53. Number of bids and bid amounts may be slightly out of date. See each listing for international shipping options and costs.